The number of on-demand video streams that can be supported concurrently is highly constrained by the stringent requirements of real-time playback and high transfer rates. To address this problem, stream merging techniques utilize the multicast facility to increase resource sharing. The achieved resource sharing depends greatly on how the waiting requests are scheduled for service. We investigate the effectiveness of the recently proposed cost-based scheduling in detail and analyze opportunities for further tunings and enhancements. In particular, we analyze alternative ways to compute the delivery cost. In addition, we propose a new scheduling policy, called Predictive Cost-Based Scheduling (PCS), which applies a prediction algorithm to predict future scheduling decisions and then uses the prediction results to potentially alter its current scheduling decisions. 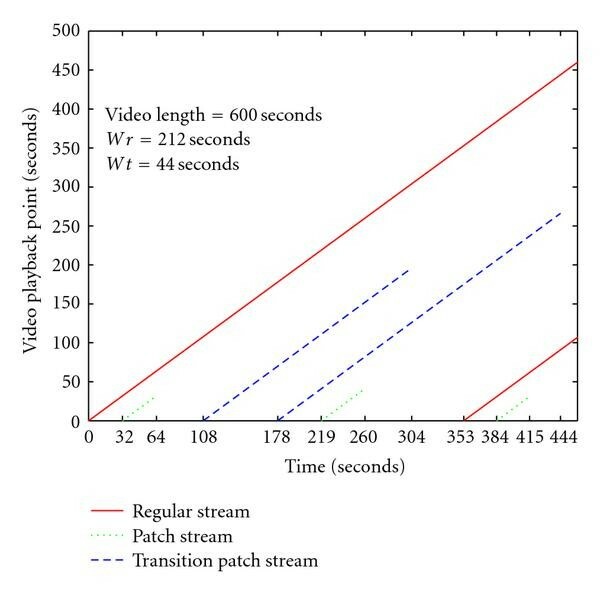 Moreover, we propose an enhancement technique, called Adaptive Regular Stream Triggering (ART), which significantly enhances stream merging behavior by selectively delaying the initiation of full-length video streams. We analyze the effectiveness of the proposed strategies in terms of their performance effectiveness and impacts on waiting-time predictability through extensive simulation. The results show that significant performance benefits as well as better waiting-time predictability can be attained. The interest in video streaming has grown dramatically across the Internet and wireless networks and continues to evolve rapidly. Unfortunately, the number of on-demand video streams that can be supported concurrently is highly constrained by the stringent requirements of multimedia data, which require high transfer rates and must be presented continuously in time. Stream merging techniques [1–7] address this challenge by aggregating clients into successively larger groups that share the same multicast streams. These techniques include Patching [1, 3], Transition Patching [8, 9], and Earliest Reachable Merge Target (ERMT) [2, 10]. Periodic broadcasting techniques [11–15] also address this challenge but can be used for only popular videos and require the requests to wait until the next broadcast times of the first corresponding segments. This paper considers the stream merging approach. The achieved resource sharing by stream merging depends greatly on how the waiting requests are scheduled for service. Despite the many proposed stream merging techniques and the numerous possible variations, there has been only a little work on the issue of scheduling in the context of these scalable techniques. The choice of a scheduling policy can be as important as or even more important than the choice of a stream merging technique, especially when the server is loaded. Minimum Cost First (MCF)  is a cost-based scheduling policy that has recently been proposed for use with stream merging. MCF captures the significant variation in stream lengths caused by stream merging through selecting the requests requiring the least cost (measured in bytes of the delivered video data). Motivated by the development of cost-based scheduling, we investigate its effectiveness in detail and discuss opportunities for further tunings and enhancements. In particular, we initially seek to answer the following two important questions. First, is it better to consider the stream cost only at the current scheduling time or consider the expected overall cost over a future period of time? Second, should the cost computation consider future stream extensions done by advanced stream merging techniques (such as ERMT) to satisfy the needs of new requests? These questions are important because the current scheduling decision can affect future scheduling decisions, especially when stream merging and cost-based scheduling are used. Additionally, we analyze the effectiveness of incorporating video prediction results into the scheduling decisions. The prediction of videos to be serviced and the prediction of waiting times for service have recently been proposed in . These prediction results, however, were not used to alter the scheduling decisions. We propose a scheduling policy, called Predictive Cost-Based Scheduling (PCS). Like MCF, PCS is cost-based, but it predicts future system state and uses the prediction results to potentially alter the scheduling decisions. It delays servicing requests at the current scheduling time (even when resource are available) if it is expected that shorter streams will be required at the next scheduling time. We present two alternative implementations of PCS. We also propose an enhancement technique, called Adaptive Regular Stream Triggering (ART), which can be applied with any scheduling policy to enhance stream merging. The basic idea of ART is to selectively delay the initiation of full-length video streams. We study the effectiveness of various strategies and design options through extensive simulation in terms of performance effectiveness as well as waiting-time predictability. The ability to inform users about how long they need to wait for service has become of great importance , especially considering the growing interest in human-centered multimedia systems. Today, even for short videos with medium quality, users of online video websites may experience significant delays. Providing users with waiting-time feedback enhances their perceived quality-of-service and encourages them to wait, thereby increasing throughput. The analyzed metrics include customer defection (i.e., turn-away) probability, average waiting time, unfairness against unpopular videos, average cost per request, waiting-time prediction accuracy, and percentage of clients receiving expected waiting times. The waiting-time prediction accuracy is determined by the average deviation between the expected and actual waiting times. We consider the impacts of customer waiting tolerance, server capacity, request arrival rate, number of videos, video length, and skew in video access. We also study the impacts of different request arrival processes and video workloads. Furthermore, in contrast with prior studies, we analyze the impact of flash crowds, whereby the arrival rate experiences sudden spikes. The results demonstrate that the proposed PCS and ART strategies significantly enhance system throughput and reduce the average waiting time for service, while providing accurate predicted waiting times. The rest of the paper is organized as follows. Section 2 provides background information on main performance metrics, stream merging, and request scheduling techniques. Section 3 analyzes cost-based scheduling and explores alternative ways to compute the cost. Sections 4 and 5 present the proposed PCS and ART strategies, respectively. Section 6 discusses the performance evaluation methodology and Section 7 presents and analyzes the main results. In this section, we discuss the main performance metrics used to evaluate scheduling policies in streaming servers. We then discuss stream merging and request scheduling. where is the defection probability for video , is the mean defection probability across all videos, and is the number of videos. In this paper, we also consider waiting-time predictability metrics as will be discussed in Section 7. Stream merging techniques aggregate users into larger groups that share the same multicast streams. In this subsection, we discuss three main stream merging techniques: Patching [1, 3, 18], Transition Patching [8, 9], and ERMT [2, 10]. In Patching, a new request joins immediately the latest full-length multicast stream for the video and receives the missing portion as a patch using a unicast stream. A full-length multicast stream is called regular stream. Both the regular and patch streams are delivered at the video playback rate. The length of a patch stream and thus its delivery cost are proportional to the temporal skew from the latest regular stream. The playback starts using the data received from the patch stream, whereas the data received from the regular stream are buffered locally for use upon the completion of the patch stream. Because patch streams are not sharable with later requests and their cost increases with the temporal skew from the latest regular stream, it is cost-effective to start a new regular stream when the patch stream length exceeds a certain value, called regular window ( ). Figure 1 further explains the concept. Initially, one regular stream (first solid line) is delivered, followed by two patch streams (next two dashed lines) to service new requests. 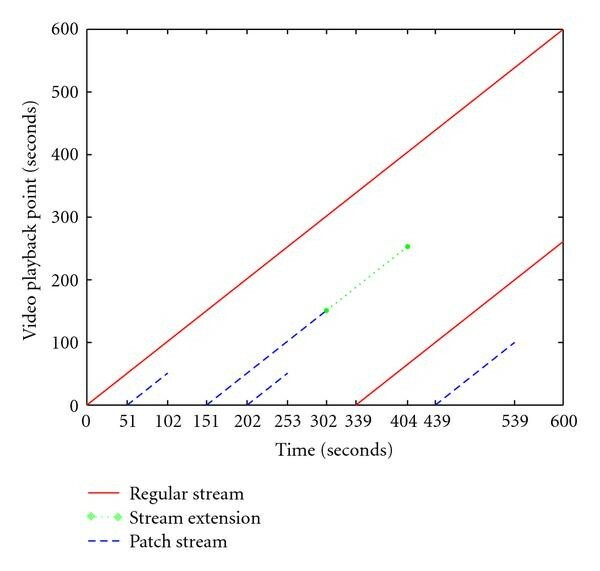 Note that the length of the patch stream is the temporal skew to the regular stream. Subsequently, another regular stream (second solid line) is initiated followed by two other patch streams. Transition Patching allows some patch streams to be sharable by extending their lengths. Specifically, it introduces another multicast stream, called transition stream. The threshold to start a regular stream is as in Patching, and the threshold to start a transition stream is called transition window ( ). Figure 2 further illustrates the concept. For example, the client at time 219 seconds starts listening to its own patch stream (second dotted line) and the closest preceding transition patch stream (second dashed line), and when its patch is completed, it starts listening to the closest preceding regular stream (first solid line). ERMT is a near optimal hierarchical stream merging technique. Whereas a stream can merge at most once in Patching and at most twice in Transition Patching, ERMT allows streams to merge multiple times, thereby leading to a dynamic merge tree. In particular, a new user or a newly merged group of users snoops on the closest stream that it can merge with if no later arrivals preemptively catch them . To satisfy the needs of the new user, the target stream may be extended, and thus its own merging target may change. Figure 3 illustrates the operation through a simple example. We can see that the third stream length got extended after the fourth stream had merged with it. Extensions are shown as dotted lines. ERMT performs better than other hierarchical stream merging alternatives and close to the optimal solution, which assumes that all request arrival times are known in advance [2, 19, 20]. Patching, Transition Patching, and ERMT differ in complexity and performance. Both the implementation complexity and performance increase from Patching to Transition Patching to ERMT. Selecting the most appropriate stream merging technique depends on a tradeoff between the required implementation complexity and the achieved performance. A scheduling policy selecting an appropriate video for service whenever it has an available channel. A channel is a set of resources (network bandwidth, disk I/O bandwidth, etc.) needed to deliver a multimedia stream. All waiting requests for the selected video can be serviced using only one channel. The number of channels is referred to as server capacity. where is the required stream length for the requests in queue , is the (average) data rate for the requested video, and is the number of waiting requests for video . To reduce the bias against videos with higher data rates, can be removed from the objective function (as done in this paper). MCF-P has two variants: Regular as Full (RAF) and Regular as Patch (RAP). RAP treats regular and transition streams as if they where patches, whereas RAF uses their normal costs. MCF-P performs significantly better than all other scheduling policies when stream merging techniques are used. In this paper, we simply refer to MCF-P (RAP) as MCF-P unless the situation calls for specificity. We seek to understand the behavior of cost-based scheduling and its interaction with stream merging. Understanding this behavior helps in developing solutions that optimize the overall performance. One of the issues that we explore in this study is determining the duration over which the cost should be computed. In particular, we seek to determine whether the cost should be computed only at the current scheduling time ( ) or over a future duration of time, called prediction window ( ). In other words, should the system select the video with the least cost per request at time or the least cost per request during . The latter requires prediction of the future system state. We devise and explore two ways to analyze the effectiveness of computing the cost over a period of time: Lookahead and Combinational scheduling. An Illustration of Lookahead Scheduling. where is the cost required to service video , and is the number of waiting requests for that video. is determined based on the used MCF-P variant. Combinational Scheduling chooses the sequence that is expected to lead to the least overall cost. Although many optimizations are possible to reduce the implementation complexity, we focus primarily on whether exploiting the correlations between successive video selections is indeed important in practical situations. The prediction of videos to be serviced and the prediction of waiting times for service have recently been proposed in . These prediction results, however, were not used to alter the scheduling decisions. In this paper, we analyze the effectiveness of incorporating video prediction results into the scheduling decisions. We propose a scheduling policy, called Predictive Cost-Based Scheduling (PCS). PCS is based on MCF, but it predicts future system state and uses this prediction to possibly alter the scheduling decisions. The basic idea can be explained as follows. When a channel becomes available, PCS determines using the MCF-P objective function the video which is to be serviced tentatively at the current scheduling time ( ) and its associated delivery cost. To avoid unfairness against videos with high data rates, we use the required stream length for the cost . Before actually servicing that video, PCS predicts the system state at the next scheduling time ( ) and estimates the delivery cost at that time assuming that video is not serviced at time . PCS does not service any request at time and thus postpones the service of video if the delivery cost at time is lower than that at time . Otherwise, video is serviced immediately. To reduce possible server underutilization, PCS delays the service of streams only if the number of available server channels (freeChannels) is smaller than a certain threshold (freeChannelThresh). Algorithm 1 shows a proposed algorithm to dynamically find the best value of freeChannelThresh. The algorithm changes the value of the threshold and observes its impact on customer defection probability over a certain time interval. The value of the threshold is then updated based on the trend in defection probability (increase or decrease) and the last action (increase or decrease) performed on the threshold. The algorithm is to be executed periodically but not frequently to ensure stable system behavior. Algorithm 1: Simplified algorithm for dynamically computing freeChannelThresh. We present two alternative implementations of PCS: PCS-V and PCS-L. These two implementations differ in how to compute the delivery cost or required stream length at the next scheduling time. PCS-V predicts the video to be serviced at the next scheduling time and simply uses its required stream length. The video prediction is done by utilizing detailed information about the current state of the server in a manner similar to that of the waiting-time prediction approach in . This information includes the number of waiting requests for each video, the completion times of running streams, and statistics such as the average request arrival rate for each video (which is to be updated periodically). Algorithm 2 shows a simplified algorithm for PCS-V.
Algorithm 2: Simplified algorithm for PCS-V.
where is the request arrival rate for video and assuming a Poisson arrival process. If the video has already one waiting request, then this probability is 1. Sorting the videos according to the scheduling objective function is required to determine the probability that all videos with lower cost (or higher objective) are not selected. Algorithm 3: Simplified algorithm for PCS-L.
As can be clearly seen from the algorithms, both PCS-V and PCS-L require a time overhead of , where is the number of videos, assuming that a priority queue structure is used to rank the videos according to the objective function. As will be shown later, our analysis reveals a significant interaction between stream merging and scheduling decisions. One of the pertaining issues is how to best handle regular (i.e., full) streams. MCF-P (RAP) considers the cost of a regular stream as a patch and thus treats it in a differentiated manner. The question arises as to whether it is worthwhile, however, to delay regular streams in certain situations. Guided by analysis, we propose a technique, called Adaptive Regular Stream Triggering (ART). A possible implementation is shown in Algorithm 4. The basic idea here is to delay regular streams as long as the number of free channels is below a certain threshold, which is to be computed dynamically based on the current workload and system state. ART uses the same algorithm (shown in Algorithm 1) to dynamically find the best value of free Channel Thresh as that of PCS. Algorithm 4: Simplified implementation of ART. To further demonstrate the main idea of ART, Figure 6 plots the ERMT merge tree without and with ART, respectively. The solid lines show the initial stream lengths and the dotted lines show later extensions. The circles identify successive extensions. With ART, there is a gap before a regular stream is initiated because of the postponement. We also observe that ART enhances the stream merging decisions of ERMT. The number of initial regular streams (called I Streams in this paper) in the merge tree is relatively much smaller with ART. For example, there is only one I Stream in the merge tree with ART while there are many more I Streams in the merge tree without ART. As can be seen form the ART algorithm in Algorithm 4, ART requires a time overhead of in addition to the time overhead of the base scheduling policy used. In principle, ART can be used with any scheduling policy, including PCS, although some negative interference happens when it is combined with PCS, as will be shown in Section 7. We study the effectiveness of the proposed policies through simulation. The simulation, written in , stops after a steady-state analysis with 95% confidence interval is reached. Table 1 summarizes the workload characteristics used. Like most prior studies, we generally assume that the arrival of the requests to the server follows a Poisson Process with an average arrival rate . We also experiment with the Weibull distribution with two parameters: shape and scale . We analyze the impact of the shape ( ), while adjusting the scale so that the desired average request arrival rate is reached. Additionally, we assume that the access to videos is highly localized and follows a Zipf-like distribution. With this distribution, the probability of choosing the th most popular video is with a parameter and a normalized constant . The parameter controls the skew of video access. Note that the skew reaches its peak when , and that the access becomes uniformly distributed when . We analyze the impact of this parameter, but we generally assume a value of 0.271 [24, 25]. two movie lengths and flash crowds arrival rate is variable. We characterize the waiting tolerance of customers by three models. In Model A, the waiting tolerance follows an exponential distribution with mean [24, 25]. In Model B, users with expected waiting times less than will wait and the others will have the same waiting tolerance as Model A [24, 25]. We use Model C to capture situations in which users either wait or defect immediately depending on the expected waiting times. The user waits if the expected waiting time is less than and defects immediately if the waiting time is greater than . Otherwise, the defection probability increases linearly from 0 to 1 for the expected waiting times between and . As in most previous studies, we generally study a server with 120 videos, each of which is 120 minutes long. We examine the server at different loads by fixing the request arrival rate at 40 requests per minute and varying the number of channels (server capacity) generally from 200 to 750. In addition to the fixed-length video workload (in which all videos have the same length), we experiment with a variable-length video workload. Moreover, we study the impacts of arrival rate, user's waiting tolerance, number of videos, and video length (in the fixed-length workload). Flash crowds workload characteristics were adopted from . To evaluate the effectiveness of the proposed schemes, we consider the main performance metrics discussed in Section 2.1. In addition, we analyze waiting-time predictability by two metrics: waiting-time prediction accuracy and the percentage of clients receiving expected waiting times. The waiting-time prediction accuracy is determined by the average deviation between the expected and actual waiting times. For waiting-time prediction, we use the algorithm in . Note that this algorithm may not provide an expected waiting time to each client because the prediction may not always be performed accurately. Let us start by studying the effectiveness of Lookahead and Combinational Scheduling. Interestingly, there is no clear benefit for computing the cost over a future period of time. In some cases, as shown in Figure 7, the performance in terms of customer defection and average waiting time may be worse than those when computing the cost at the current scheduling time with MCF-P. The results of Lookahead Scheduling are shown for two different prediction window values. Only the results with future stream extensions are shown. The results without extensions are almost the same. Although computing the cost over a time interval seems intuitively to be an excellent choice, it interferes negatively with stream merging. 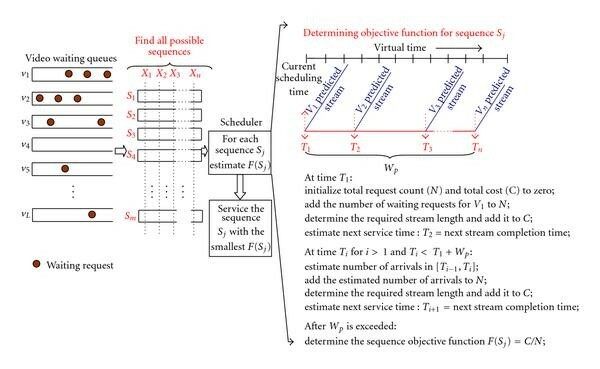 Later in this paper, we discuss how the interaction between stream merging and scheduling can be utilized by using the proposed ART technique, which can be used with any scheduling policy. Based on these results, we only consider next computing the cost at the current scheduling time. Figures 8, 9, and 10 demonstrate the effectiveness of the two implementations of PCS when applied with ERMT, Transition Patching, and Patching, respectively, in terms of the customer defection probability, average waiting time, and unfairness. The figures show that PCS outperforms MCF-P and MQL in terms of both the two most important performance metrics (defection probability and average waiting time), whereas MCF-P is fairer towards unpopular videos. The two implementations of PCS perform nearly the same and thus PCS-V is preferred because of its simplicity. From this point on, we consider only the PCS-V implementation. Figure 11 shows the effectiveness of the proposed ART technique when ERMT is used. With MCF-P, ART reduces the customer defection probability and average waiting time by up to and , respectively. It also yields significant improvements when used with MQL. Unfairness, the least important metric, is a little larger with ART because of its nature in favoring videos with shorter streams, but it is still acceptable compared with MQL. Figure 12 depicts the impact of ART on regular streams in ERMT. We observe that when ART postpones regular streams, it forces ERMT to make more merges, which, in turn, increases system utilization. We also observe that the number of regular streams does not decrease significantly despite of postponing these streams. In contrast, Figure 12(a) indicates that the average time between two successive regular streams for popular videos is even smaller with ART than that without it. This is because ERMT keeps extending streams, which eventually become regular streams. Figures 12(b) and 12(c) compare the percentage of initial regular streams (I Streams) and extended regular streams (E Streams) without and with ART, respectively. We can see that the percentage of extended regular streams with ART is much higher. This supports the fact that the number of regular streams is not reduced by postponing. In summary, we can say that ART improves ERMT by replacing many I Streams with E Streams. Let us now discuss the impact of ART when Transition Patching and Patching are used. Transition Patching results are presented in Figure 13 and Patching results are presented in Figure 14. As with ERMT, ART reduces significantly the customer defection probability and the average waiting time when it is combined with MCF-P and MQL. Unfairness with ART is a little larger but still acceptable compared with that of MQL for medium and high server capacities. Although ART can be applied with any scheduling policy, including PCS, for the time being, we consider it as an alternative to PCS because of negative interference between the two, as will be shown in Section 7.8. In this subsection, we compare the effectiveness of PCS-V and ART in terms of customer defection probability, average waiting time, unfairness against unpopular videos, and cost per request. Figures 16, 17, and 18 show the results of ERMT, Transition Patching, and Patching respectively. With ERMT, MCF-P when combined with ART performs better than PCS-V in terms of the customer defection probability and average waiting time. The results when Transition Patching and Patching are used exhibit different behavior than those with ERMT. MCF-P combined with ART gives almost the same results as PCS-V in terms of customer defection probability, but it reduces the average waiting time significantly. Unfairness of PCS-V is less than that with ART in all stream merging techniques because ART favors videos with shorter streams more than PCS-V. These results indicate that MCF-P when combined with ART is the best overall performer. To further support the fact that more customers are served with only one stream when using ART, Figure 19 demonstrates the impact of ART on the cost per request. We can see that the cost per request with ART is the lowest for different server capacities. Figures 20, 21, 22, and 23 illustrate the impact of the request arrival rate, customer waiting tolerance, number of videos, and video length on the effectiveness of PCS-V and ART. The results for both Patching and ERMT are shown. The results demonstrate that ART always achieves smaller customer defection probability and average waiting time than PCS-V in the case of ERMT. In Patching, the same trend is observed for the average waiting time, but PCS-V and "MCF-P combined with ART" perform nearly the same in terms of customer defection probability, especially when the server is highly loaded. 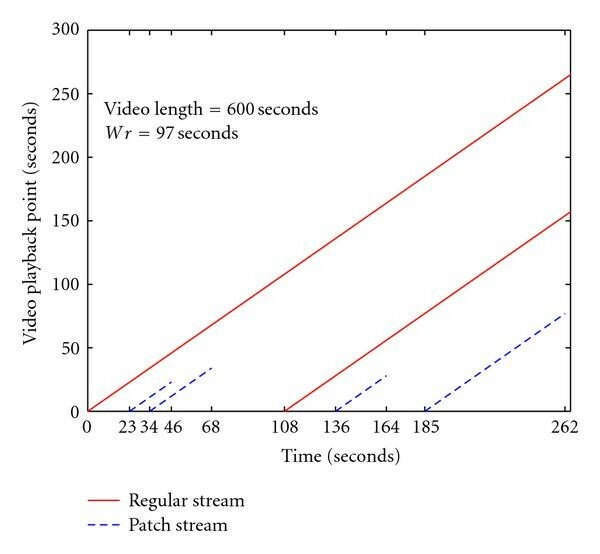 Figure 24 shows that the skew in video access has significant impacts on the customer defection probability, average waiting time, and unfairness. Recall that as increases, the skew in video access decreases. Both the defection probability and average waiting time are worsen by the reduction in the skew. This is because cost-based scheduling policies favor popular videos by nature. When increases, the deference in video popularity decreases which in turns makes the scheduling decision harder to make. Unfairness decreases by increasing which is as expected. Again, "MCF-P combined with ART" is the best policy in terms of all performance metrics, except unfairness. The results so far are for a video workload of a fixed video length. Figure 25 shows the customer defection probability, average waiting time and unfairness results for a variable-length video workload. The workload is comprised of videos with lengths in the range of 60 to 180 minutes. The length of each video is generated randomly within the specified range. The results for the workload are obtained by averaging the values of four runs. The PCS-V and ART algorithms also work well in this workload. "MCF-P combined with ART" as in most cases performs better than all other policies. Moreover, we can see that the fairness of ART and PCS-V is better than that of MCF-P with variable-length video workload. The results so far assume a Poisson request arrival process. Let us now examine the behavior under Weibull distribution with different shape ( ) values. Figure 26 demonstrates that the shape has a little impact, especially when the server capacity is larger than 500 channels. Figure 27 compares MCF-P, PCS-V, and MCF-P with ART under Weibull Arrival Distribution with the same shape. The results with other shape parameters have the same trend and thus are not shown. We can see clearly that PCS-V and "MCF-P combined with ART" sill perform better than MCF-P. We can see also that MCF-P with ART is the best policy. Figure 28 compares the predictability of MCF-P, PCS-V, and "MCF-P combined with ART" in terms of the average deviation and percentage of clients receiving expected time of service (PCRE) under waiting tolerance Model B. The results with Model are similar and thus are not shown. The results demonstrate that ART significantly improves the predictability of MCF-P. PCS-V is also more predictable than MCF-P. In particular, ART reduces the average deviation by up to and for models B and C, respectively. It also increases the number of clients receiving expected times by up to . Moreover, "MCF-P combined with ART" gives more customers expected times than PCS-V with a relatively less significant increase in the average deviation. Let us now discuss the impact of flash crowds on the the effectiveness of PCS-V and ART. Figure 29 demonstrates the impact of flash crowds interarrival time on MCF-P, PCS-V, and "MCF-P combined with ART." The results shows that MCF-P when combined with ART handles the flash crowds more efficiently than the other policies. In particular, it achieves the best customer defection probability and average waiting time under all flash crowds interarrival times. 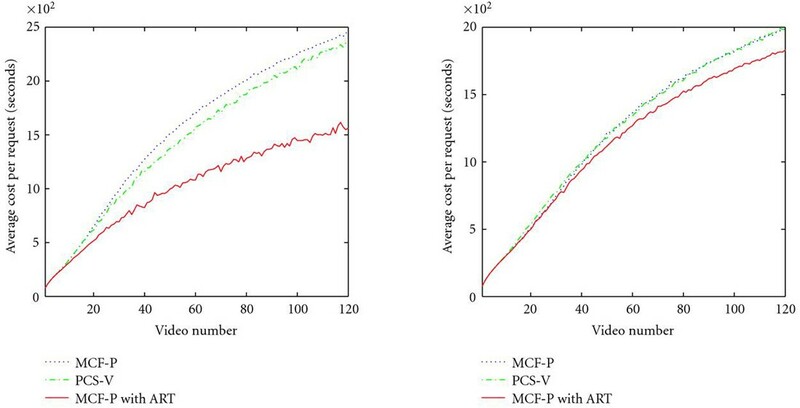 PCS-V achieves better results than MCF-P, but its improvement is less than that of ART. Figure 30 confirms that ART enhances the efficiency of stream handling even with flash crowds. It is clearly evident that "MCF-P combined with ART" achieves the lowest cost per request for all videos. Let us now look at the results of combining PCS-V with ART. We show the results under ERMT and Patching in Figures 31 and 32, respectively. Transition Patching has the same trend as Patching and therefore its results are not shown. These results indicate that "MCF-P combined with ART" performs the best among all variations, and that PCS-V performs better than "PCS-V with ART." From these figures, we conclude that negative interference occurs when ART is combined with PCS-V. Removing this interference by modifying these two strategies is a challenging task and left for a future study. 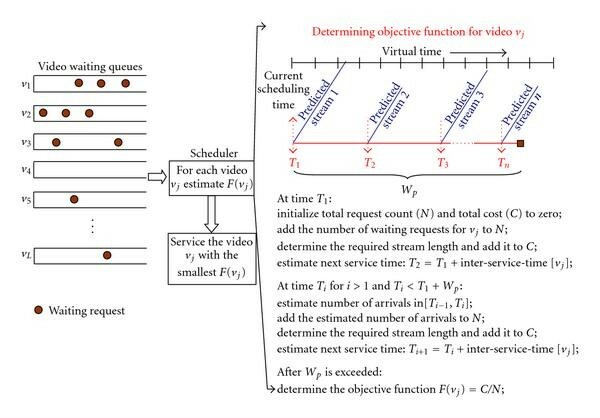 We have analyzed in detail cost-based scheduling for on-demand video streaming and proposed new strategies: Predictive Cost-Based Scheduling (PCS) and Adaptive Regular Stream Triggering (ART). The main results can be summarized as follows. There is no clear advantage of computing the cost over a future time window, compared with computing the cost only at the next scheduling time. The proposed PCS scheduling policy outperforms the best existing policy (MCF-P) in terms of customer defection probability and average waiting time. The waiting times can also be predicted more accurately with PCS. The two variations of PCS (PCS-V and PCS-L) perform nearly the same and thus the simpler variant (PCS-V) is preferred because of its lower implementation complexity. By enhancing stream merging behavior, the proposed ART technique substantially improves both the customer defection probability and the average waiting time. Although ART in principle can be applied with any scheduling policy, including PCS, negative interference exists between ART and PCS, and thus their combination generally achieves worse than any of them applied individually. Removing this interference by modifying these two strategies is a challenging task and left for a future study. The best overall performer is "MCF-P combined with ART", followed by PCS. With ART, significantly more clients can receive expected waiting times for service than PCS, but at a somewhat lower waiting time accuracy. This paper is a revised and extended version of our paper "Performance and waiting-time predictability analysis of design options in cost-based scheduling for scalable media streaming," which was presented at the International MultiMedia Modeling Conference (MMM 2009), Antipolis, France, January 2009. It also combines the MMM 2009 paper with a short paper "Predictive cost-based scheduling for scalable video streaming," presented at the IEEE International Conference on Multimedia & Expo (ICME 2008), Hannover, Germany, June 2008. This work was supported in part by NSF Grants CNS-0626861 and CNS-0834537.